Check out more pictures from the action here! 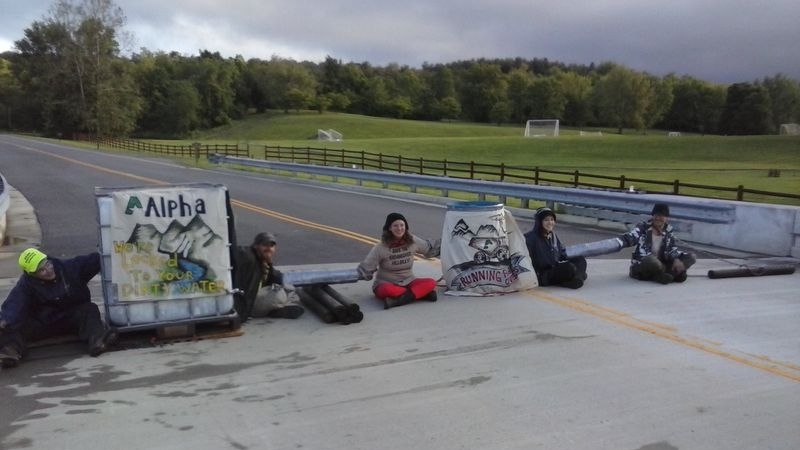 BRISTOL, VA.— Three residents of Central Appalachia and supporters with Mountain Justice chained themselves to an industrial tank of black water in front of Alpha Natural Resources’ Bristol, Va., headquarters to protest Alpha’s mountaintop removal strip mining and coal slurry operations across the region. “I’m risking arrest today because mountaintop removal has to end now for the future viability of Appalachia,” says Emily Gillespie of Roanoke, Va., whose work with the Mountain Justice movement is inspired by Appalachian women’s history of non-violent resistance. The tank of water represents coal contamination from affected communities across the Appalachian region. The group called for Alpha to stop seeking an expansion of the Brushy Fork coal slurry impoundment in Raleigh County, W.Va. “We want Kevin Crutchfield, CEO of Alpha Natural Resources, to produce a signed document expressing that they won’t seek the expansion of the Brushy Fork Impoundment before we leave,” Junior Walk, 23, from the Brushy Fork area said. More than 20 peer-reviewed studies since 2010 demonstrate a connection between mountaintop removal coal mining operations and increased cases of kidney, lung, and heart diseases, as well as increased birth defects and early mortality. The ACHE act, currently in sub committee in Washington, calls for a moratorium on new mountaintop removal operations until a definitive, non-partisan study can demonstrate the reason for these community health emergency levels of health impacts. The impoundment at Brushy Fork holds back almost 5 billion gallons of toxic sludge and is considered the largest earthen dam in the Western hemisphere. Recently leaked records show that Alpha’s coal slurry impoundments in Appalachia failed 59 out of 75 73 total structural tests performed by the Office of Surface Mining. “Alpha is only profitable because they’re allowed to gamble with our lives—and we’re the ones who pay the cost of their negligence and toxic pollution,” Walk said. Alpha has lost numerous lawsuits relating to pollution from mining wastes in recent years, but they continue to violate safety regulations and expand their hazardous operations. After refusing to take responsibility for the massive floods caused by the King Coal Highway and their destructive mountaintop removal mining practices, Alpha continues to push forward similar projects, such as the controversial Coalfields Expressway in Virginia.